This spectacular 2100 square foot, vacation rental home is nestled in a beautiful and secluded mountain meadow. 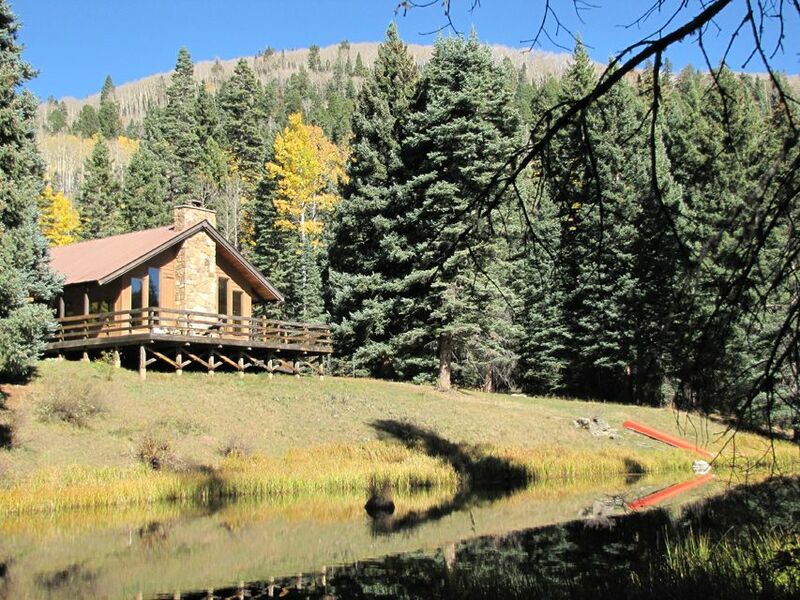 The home sits on 11 acres surrounded by the San Juan National Forest and features a large pond, several streams, open fields of wildflowers and forests of aspens and spruce. Located only five miles from Vallecito Lake, it's a perfect place for an unforgettable, 'get-away-from-it-all' vacation where you can relax on a covered deck, paddle a canoe on your own glassy pond, play a game of horseshoes, gaze into an endless starry night, and enjoy the crystal clear water and cool fresh air of Colorado mountain living. The two-story house features four bedrooms, two and a half bathrooms, along with a comfortable living room with an incredible floor-to-ceiling rock fireplace. A large deck wraps around the home with a covered, shaded sitting area looking out over the pond, meadow and trees. AVAILABLE MAY - OCTOBER. NOT ACCESSIBLE DURING WINTER. Secluded location for ultimate solitude. Focus on family and other guests, no internet no digital device interference. Very clean and well equipped. It’s an off-grid home setup with more amenities than most metropolitan rentals. Have no hesitations with staying here. All you’ll need is 4WD, an some groceries! Drink lots of water, (tap water tasted great) and breath as much aspen air in as possible! Greg and Jan are great hosts! The property was awesome, our dogs had a blast! It was so lovely to be so removed from city life. The property was amazing, the fact that it is run on solar power is so cool. I love the fact that there was no Wi-Fi, or television. We stood or sat and looked at the stars every night, then built a fire and played cards. We left the windows open so it would stay cool inside and each morning we built a fire as well to warm up. We didn’t see much wildlife I think because of the dogs. But boy, it was lovely! Our family stayed at the cabin in mid August. Temperatures were in the low 80's during the day and low 50's at night. The house is remote, but was exactly what we were looking for. There is ample room in the house and property for family and pets. We utilized the games and recreational components of the property to keep ourselves entertained. While the cabin is remote and the drive to the house is rugged, it was worth the quality time spent away from the fast pace of life. Our family visited Vallecito Reservoir, Durango, Pagaso Springs and Bayfield. However, our best times were spent on the back porch of the house. Although the cabin is modest and secluded, it provided everything we needed to enjoy our stay. We were able to relax or stay as active as we desired. I would definitely recommend the property to families desiring to get away from the fast pace of life and who enjoy the outdoors and time together! Thanks for the kind words. We're glad you enjoyed your stay! This house couldn't have been more perfect! My family was traveling to the area for my wedding. We wanted to rent a house so everyone could stay together. We looked at many rental homes in this area and this by far was our favorite and it did not let use down. Eight of us stayed in the house comfortably. I loved the fact that there is no t.v., internet or cell phone service. In the house everything was provided, however coolers were needed which is not a big deal. Everyone enjoyed going up and down the mountain seeing all the wildlife such as cows, deer, and turkeys that we saw. The house was clean and well maintain. The owners of the home were great, very caring and considerate about our stay. They described and explained everything you need to know about the home. We enjoyed the fireplace and porch after sunset which was so relaxing. We went for hikes around the house looking for wildlife. Wish we would have been able to stay longer. The master bedroom has a fabulous comfortable bed. We will definitely be staying here again. Wonderful remote , secluded cabin! Thank you for opening up your home to us. Our family get together was amazing here. We had 7 adults, 1 baby and 1 little dog. Plenty of room for everyone! The adult kids enjoyed canoeing in the pond. We all enjoyed the puzzles, playing ping pong and just sitting around the deck or in front of the fireplace. There was plenty of firewood provided. Kitchen well stocked with appliances. Plenty of linen and the beds were very comfortable. We drove up in a van, and got stuck in a couple places driving up. We had to push our way out. During the rains, you definitely will need a 4-wheel drive or a truck. Our van was too low for some spots and had to go very very slow. But don't let that stop you! it was well worth it! The owners were quick to respond to any questions or concerns we had. We would definitely recommend to everyone and we would definitely stay again! Our family spent a fantastic 7 nights in this beautiful secluded cabin. We had 6 adults and 4 kids, ages 9, 7, 3 & 1. There was plenty of room for all of us. It was so peaceful and relaxing, not one of us missed having access to technology. It was a nice break. The kids loved canoeing in the pond, catching salamanders, riding our side by sides up Middle Mountain Road to explore, walking the close by trails and simply relaxing with playing the games at the cabin or playing cards. We also made a lot of s'mores by the campfire. We really didn't do much traveling when we got there, only made a couple trips to Durango which was only a 45 min drive. We spent pretty much the whole time at the cabin. It was just too relaxing to leave! The view of the stars at night were breathtaking. The chimpmonks were always running around our feet and hummingbirds would fly right up to us like they we're greeting us. So cool! The cabin was well supplied with toiletries and the kitchen was well supplied with cooking utensils. Even though we didn't need to get in touch with Greg or Jan during our stay, they were very helpful and so nice to work with before we got to the cabin. I would definitely come back again and, for sure, recommend this to anyone wanting to get away from it all for some much needed relaxation. I can't express how peaceful and serene it was. Absolutely beautiful!!! Thank you Greg and Jan for offering your cabin on home away!! Thank you Vicki for the very kind words. So happy you all had such a good time at our home. You are welcome back anytime! Located 35 miles NE of Durango, Vallecito Lake is a quiet, scenic spot sheltered in a mountain valley 8,000 feet above the sea. The lake is surrounded by the San Juan National Forest and Weminuche Wilderness, over 2.5 million acres of public land.